I’ve decided I want to do more reviews and critiques, since I really enjoy writing them. So you’ll be seeing more posts about music, movies, and books that I’ve experienced lately. I didn’t watch a ton of Christmas films this year, but I did see a couple. 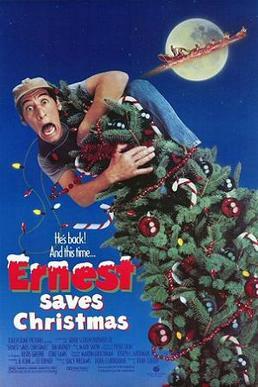 My boyfriend couldn’t believe that I hadn’t seen “Ernest Saves Christmas”, (or any of the Ernest movies for that matter), so when we saw it was on Netflix, I knew we’d end up watching it. For those of you not not familiar with the Ernest movies, Ernest (played by Jim Varney) is a doofy, clumsy guy, probably in his thirties, who doesn’t seem to have a clue. He has a “friend”, Vern, who he well-meaningly harasses all the time, destroying his house trying to decorate for Christmas. You know, all the things real friends do. Vern’s perspective is always just the camera watching Ernest’s antics, and trying to push him out of the house. Ernest Saves Christmas focuses on Santa Claus, who is in Orlando to appoint his successor. In this movie universe, Santa’s magic is passed from person to person, so that the Christmas Spirit stays alive and healthy. Santa has waited a year too long to appoint his successor, so he’s a bit flaky, and his magic is a little rusty. Santa gets in Ernest’s cab, which is a pretty crazy ride, and accidentally leaves his magic sack there. On the way, they pick up a teenage girl who was running from a waiter chasing her down for a skipped check. So this girl gets in a cab with two strange men, and for some reason ends up sticking around the whole movie. This is definitely an 80s movie. The girl is, of course, a runaway, and spending time with Santa Claus makes her realize that life’s pretty good and she should go back home- but not before she falls back on her habit of lying and trying to get away with things that aren’t hers. Ernest bumbles around trying to get Santa his bag back, then trying to get the sleigh from the airport delivery station. Santa spends the whole time trying to track down Joe, the perfect candidate for Santa, but whose sleazy agent (he’s an actor) keeps keeping Santa away. Overall, this is a super fun movie, definitely meant for the cheap laughs of slapstick. Every one parts ways in the end, happier, and ready to move on from the crazy adventure of the movie. Santa even managed to find himself a lady! And he moves fast- had his arm around her shoulder and everything. I thought it was cute, and would be great for kids, though it’s definitely the type of movie that gets them wound up and bouncing off the walls. Ernest is really obnoxious, but that’s what he’s supposed to be. I was surprised to learn that Jim Varney had a background in theatre, and some more serious roles, but decided to stick with the Ernest movies (and later television show). Sometimes the fun stuff is where it’s at. I’m not sure I’d enjoy any of the other Ernest shows, it’s not really my humor. But Christmas movies are supposed to be cheesy, and this one hit that mark perfectly. Also, I love the runaway girl’s attitude and style. Perfect 1980s teenager. Posted on December 28, 2014, in reviews and tagged 80s, christmas, movies, reviews. Bookmark the permalink. Leave a comment.